Not to be confused with warm and cool colors. The CIE 1931 x,y chromaticity space, also showing the chromaticities of black-body light sources of various temperatures (Planckian locus), and lines of constant correlated color temperature. The color temperature of a light source is the temperature of an ideal black-body radiator that radiates light of a color comparable to that of the light source. Color temperature is a characteristic of visible light that has important applications in lighting, photography, videography, publishing, manufacturing, astrophysics, horticulture, and other fields. In practice, color temperature is meaningful only for light sources that do in fact correspond somewhat closely to the radiation of some black body, i.e., light in a range going from red to orange to yellow to white to blueish white; it does not make sense to speak of the color temperature of, e.g., a green or a purple light. Color temperature is conventionally expressed in kelvins, using the symbol K, a unit of measure for absolute temperature. Color temperatures over 5000 K are called "cool colors" (bluish), while lower color temperatures (2700–3000 K) are called "warm colors" (yellowish). "Warm" in this context is an analogy to radiated heat flux of traditional incandescent lighting rather than temperature. The spectral peak of warm-coloured light is closer to infrared, and most natural warm-coloured light sources emit significant infrared radiation. The fact that "warm" lighting in this sense actually has a "cooler" color temperature often leads to confusion. The black-body radiance (Bλ) vs. wavelength (λ) curves for the visible spectrum. The vertical axes of Planck's law plots building this animation were proportionally transformed to keep equal areas between functions and horizontal axis for wavelengths 380–780 nm. K indicates the color temperature in Kelvins, and M indicates the color temperature in micro reciprocal degrees. The color temperature of the electromagnetic radiation emitted from an ideal black body is defined as its surface temperature in kelvins, or alternatively in micro reciprocal degrees (mired). This permits the definition of a standard by which light sources are compared. To the extent that a hot surface emits thermal radiation but is not an ideal black-body radiator, the color temperature of the light is not the actual temperature of the surface. An incandescent lamp's light is thermal radiation, and the bulb approximates an ideal black-body radiator, so its color temperature is essentially the temperature of the filament. Thus a relatively low temperature emits a dull red and a high temperature emits the almost white of the traditional incandescent light bulb. Metal workers are able to judge the temperature of hot metals by their color, from dark red to orange-white and then white (see red heat). Many other light sources, such as fluorescent lamps, or LEDs (light emitting diodes) emit light primarily by processes other than thermal radiation. This means that the emitted radiation does not follow the form of a black-body spectrum. 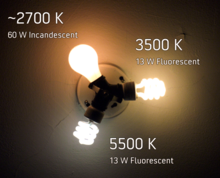 These sources are assigned what is known as a correlated color temperature (CCT). CCT is the color temperature of a black-body radiator which to human color perception most closely matches the light from the lamp. Because such an approximation is not required for incandescent light, the CCT for an incandescent light is simply its unadjusted temperature, derived from comparison to a black-body radiator. The Sun closely approximates a black-body radiator. The effective temperature, defined by the total radiative power per square unit, is about 5780 K. The color temperature of sunlight above the atmosphere is about 5900 K.
As the Sun crosses the sky, it may appear to be red, orange, yellow or white, depending on its position. The changing color of the Sun over the course of the day is mainly a result of the scattering of light and is not due to changes in black-body radiation. The blue color of the sky is caused by Rayleigh scattering of the sunlight by the atmosphere, which tends to scatter blue light more than red light. Some early morning and evening light (golden hours) has a lower color temperature due to increased low-wavelength light scattering by the Tyndall effect. Daylight has a spectrum similar to that of a black body with a correlated color temperature of 6500 K (D65 viewing standard) or 5500 K (daylight-balanced photographic film standard). For colors based on black-body theory, blue occurs at higher temperatures, whereas red occurs at lower temperatures. This is the opposite of the cultural associations attributed to colors, in which "red" is "hot", and "blue" is "cold". For lighting building interiors, it is often important to take into account the color temperature of illumination. A warmer (i.e., a lower color temperature) light is often used in public areas to promote relaxation, while a cooler (higher color temperature) light is used to enhance concentration, for example in schools and offices. CCT dimming for LED technology is regarded as a difficult task, since binning, age and temperature drift effects of LEDs change the actual color value output. Here feedback loop systems are used, for example with color sensors, to actively monitor and control the color output of multiple color mixing LEDs. In fishkeeping, color temperature has different functions and foci in the various branches. In freshwater aquaria, color temperature is generally of concern only for producing a more attractive display. Lights tend to be designed to produce an attractive spectrum, sometimes with secondary attention paid to keeping the plants in the aquaria alive. In a saltwater/reef aquarium, color temperature is an essential part of tank health. Within about 400 to 3000 nanometers, light of shorter wavelength can penetrate deeper into water than longer wavelengths, providing essential energy sources to the algae hosted in (and sustaining) coral. This is equivalent to an increase of color temperature with water depth in this spectral range. Because coral typically live in shallow water and receive intense, direct tropical sunlight, the focus was once on simulating this situation with 6500 K lights. In the meantime higher temperature light sources have become more popular, first with 10000 K and more recently 16000 K and 20000 K. Actinic lighting at the violet end of the visible range (420–460 nm) is used to allow night viewing without increasing algae bloom or enhancing photosynthesis, and to make the somewhat fluorescent colors of many corals and fish "pop", creating brighter display tanks. In digital photography, the term color temperature is sometimes used interchangeably with white balance, which allow a remapping of color values to simulate variations in ambient color temperature. Most digital cameras and raw image software provide presets simulating specific ambient values (e.g., sunny, cloudy, tungsten, etc.) while others allow explicit entry of white balance values in kelvins. These settings vary color values along the blue–yellow axis, while some software includes additional controls (sometimes labeled "tint") adding the magenta–green axis, and are to some extent arbitrary and a matter of artistic interpretation. Use of absolute color temperature values are unlikely to be popular with digital photographers, as those with physical science backgrounds will note. However the general idea of high K (blue-white) and low K (red-orange) will inform all who seek to experiment with their own hardware and software. Photographic emulsion film does not respond to lighting color identically to the human retina or visual perception. An object that appears to the observer to be white may turn out to be very blue or orange in a photograph. The color balance may need to be corrected during printing to achieve a neutral color print. The extent of this correction is limited since color film normally has three layers sensitive to different colors and when used under the "wrong" light source, every layer may not respond proportionally, giving odd color casts in the shadows, although the mid-tones may have been correctly white-balanced under the enlarger. Light sources with discontinuous spectra, such as fluorescent tubes, cannot be fully corrected in printing either, since one of the layers may barely have recorded an image at all. Photographic film is made for specific light sources (most commonly daylight film and tungsten film), and, used properly, will create a neutral color print. Matching the sensitivity of the film to the color temperature of the light source is one way to balance color. If tungsten film is used indoors with incandescent lamps, the yellowish-orange light of the tungsten incandescent lamps will appear as white (3200 K) in the photograph. Color negative film is almost always daylight-balanced, since it is assumed that color can be adjusted in printing (with limitations, see above). Color transparency film, being the final artefact in the process, has to be matched to the light source or filters must be used to correct color. Filters on a camera lens, or color gels over the light source(s) may be used to correct color balance. When shooting with a bluish light (high color temperature) source such as on an overcast day, in the shade, in window light, or if using tungsten film with white or blue light, a yellowish-orange filter will correct this. For shooting with daylight film (calibrated to 5600 K) under warmer (low color temperature) light sources such as sunsets, candlelight or tungsten lighting, a bluish (e.g. #80A) filter may be used. More-subtle filters are needed to correct for the difference between, say 3200 K and 3400 K tungsten lamps or to correct for the slightly blue cast of some flash tubes, which may be 6000 K.
Photographers sometimes use color temperature meters. These are usually designed to read only two regions along the visible spectrum (red and blue); more expensive ones read three regions (red, green, and blue). However, they are ineffective with sources such as fluorescent or discharge lamps, whose light varies in color and may be harder to correct for. Because this light is often greenish, a magenta filter may correct it. More sophisticated colorimetry tools can be used if such meters are lacking. D50 is scientific shorthand for a standard illuminant: the daylight spectrum at a correlated color temperature of 5000 K. Similar definitions exist for D55, D65 and D75. Designations such as D50 are used to help classify color temperatures of light tables and viewing booths. When viewing a color slide at a light table, it is important that the light be balanced properly so that the colors are not shifted towards the red or blue. Digital cameras, web graphics, DVDs, etc., are normally designed for a 6500 K color temperature. The sRGB standard commonly used for images on the Internet stipulates (among other things) a 6500 K display white point. The NTSC and PAL TV norms call for a compliant TV screen to display an electrically black and white signal (minimal color saturation) at a color temperature of 6500 K. On many consumer-grade televisions, there is a very noticeable deviation from this requirement. However, higher-end consumer-grade televisions can have their color temperatures adjusted to 6500 K by using a preprogrammed setting or a custom calibration. Current versions of ATSC explicitly call for the color temperature data to be included in the data stream, but old versions of ATSC allowed this data to be omitted. In this case, current versions of ATSC cite default colorimetry standards depending on the format. Both of the cited standards specify a 6500 K color temperature. Most video and digital still cameras can adjust for color temperature by zooming into a white or neutral colored object and setting the manual "white balance" (telling the camera that "this object is white"); the camera then shows true white as white and adjusts all the other colors accordingly. White-balancing is necessary especially when indoors under fluorescent lighting and when moving the camera from one lighting situation to another. Most cameras also have an automatic white balance function that attempts to determine the color of the light and correct accordingly. While these settings were once unreliable, they are much improved in today's digital cameras and produce an accurate white balance in a wide variety of lighting situations. Video camera operators can white-balance objects that are not white, downplaying the color of the object used for white-balancing. For instance, they can bring more warmth into a picture by white-balancing off something that is light blue, such as faded blue denim; in this way white-balancing can replace a filter or lighting gel when those are not available. Cinematographers do not “white balance” in the same way as video camera operators; they use techniques such as filters, choice of film stock, pre-flashing, and, after shooting, color grading, both by exposure at the labs and also digitally. Cinematographers also work closely with set designers and lighting crews to achieve the desired color effects. For artists, most pigments and papers have a cool or warm cast, as the human eye can detect even a minute amount of saturation. Gray mixed with yellow, orange, or red is a “warm gray”. Green, blue, or purple create “cool grays”. Note that this sense of temperature is the reverse of that of real temperature; bluer is described as “cooler” even though it corresponds to a higher-temperature black body. Lighting designers sometimes select filters by color temperature, commonly to match light that is theoretically white. Since fixtures using discharge type lamps produce a light of a considerably higher color temperature than do tungsten lamps, using the two in conjunction could potentially produce a stark contrast, so sometimes fixtures with HID lamps, commonly producing light of 6000–7000 K, are fitted with 3200 K filters to emulate tungsten light. Fixtures with color mixing features or with multiple colors, (if including 3200 K) are also capable of producing tungsten-like light. Color temperature may also be a factor when selecting lamps, since each is likely to have a different color temperature. Black-body radiators are the reference by which the whiteness of light sources is judged. A black body can be described by its color temperature, whose hues are depicted above. By analogy, nearly Planckian light sources such as certain fluorescent or high-intensity discharge lamps can be judged by their correlated color temperature (CCT), the color temperature of the Planckian radiator that best approximates them. 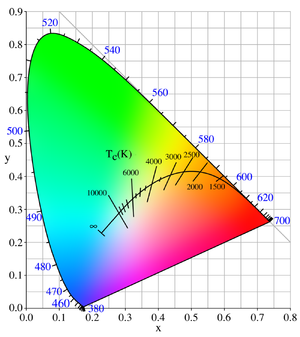 For light source spectra that are not Planckian, color temperature is not a well defined attribute; the concept of correlated color temperature was developed to map such sources as well as possible onto the one-dimensional scale of color temperature, where "as well as possible" is defined in the context of an objective color space. Judd's (r,g) diagram. The concentric curves indicate the loci of constant purity. Judd's Maxwell triangle. Planckian locus in gray. Translating from trilinear co-ordinates into Cartesian co-ordinates leads to the next diagram. Judd's uniform chromaticity space (UCS), with the Planckian locus and the isotherms from 1000 K to 10000 K, perpendicular to the locus. Judd calculated the isotherms in this space before translating them back into the (x,y) chromaticity space, as depicted in the diagram at the top of the article. Close up of the Planckian locus in the CIE 1960 UCS, with the isotherms in mireds. Note the even spacing of the isotherms when using the reciprocal temperature scale and compare with the similar figure below. The even spacing of the isotherms on the locus implies that the mired scale is a better measure of perceptual color difference than the temperature scale. "Those for which the spectral distribution of energy is identical with that given by the Planckian formula." "Those for which the spectral distribution of energy is not identical with that given by the Planckian formula, but still is of such a form that the quality of the color evoked is the same as would be evoked by the energy from a Planckian radiator at the given color temperature." "Those for which the spectral distribution of energy is such that the color can be matched only approximately by a stimulus of the Planckian form of spectral distribution." Raymond Davis published a paper on "correlated color temperature" (his term). Referring to the Planckian locus on the r-g diagram, he defined the CCT as the average of the "primary component temperatures" (RGB CCTs), using trilinear coordinates. The CIE announced the XYZ color space. KΔE = |c1 − c2| = max(|r1 − r2|, |g1 − g2|). A difference of one micro-reciprocal-degree (μrd) is fairly representative of the doubtfully perceptible difference under the most favorable conditions of observation. The first verified the findings of Priest, Davis, and Judd, with a paper on sensitivity to change in color temperature. The third depicted the locus of the isothermal chromaticities on the CIE 1931 x,y chromaticity diagram. Since the isothermal points formed normals on his UCS diagram, transformation back into the xy plane revealed them still to be lines, but no longer perpendicular to the locus. MacAdam's "uniform chromaticity scale" diagram; a simplification of Judd's UCS. This (u,v) chromaticity space became the CIE 1960 color space, which is still used to calculate the CCT (even though MacAdam did not devise it with this purpose in mind). Using other chromaticity spaces, such as u'v', leads to non-standard results that may nevertheless be perceptually meaningful. ; positive for points above the locus. This concept of distance has evolved to become Delta E, which continues to be used today. in the CIE 1960 UCS. , a chromaticity co-ordinate may be equidistant to two points on the locus, causing ambiguity in the CCT. where n = (x − xe)/(y - ye) is the inverse slope line, and (xe = 0.3320, ye = 0.1858) is the "epicenter"; quite close to the intersection point mentioned by Kelly. 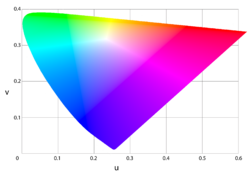 The maximum absolute error for color temperatures ranging from 2856 K (illuminant A) to 6504 K (D65) is under 2 K.
The inverse calculation, from color temperature to corresponding chromaticity coordinates, is discussed in Planckian locus. The CIE color rendering index (CRI) is a method to determine how well a light source's illumination of eight sample patches compares to the illumination provided by a reference source. Cited together, the CRI and CCT give a numerical estimate of what reference (ideal) light source best approximates a particular artificial light, and what the difference is. Characteristic spectral power distributions (SPDs) for an incandescent lamp (left) and a fluorescent lamp (right). The horizontal axes are wavelengths in nanometers, and the vertical axes show relative intensity in arbitrary units. Light sources and illuminants may be characterized by their spectral power distribution (SPD). The relative SPD curves provided by many manufacturers may have been produced using 10 nm increments or more on their spectroradiometer. The result is what would seem to be a smoother ("fuller spectrum") power distribution than the lamp actually has. Owing to their spiky distribution, much finer increments are advisable for taking measurements of fluorescent lights, and this requires more expensive equipment. , other color indices can be used as well. The color temperature (as well as the correlated color temperature defined above) may differ largely from the effective temperature given by the radiative flux of the stellar surface. For example, the color temperature of an A0V star is about 15000 K compared to an effective temperature of about 9500 K.
Characteristic spectral power distribution of an A0V star (Teff = 9500 K, cf. 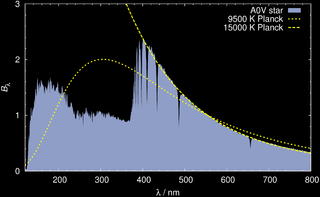 Vega) compared to black-body spectra. The 15000 K black-body spectrum (dashed line) matches the visible part of the stellar SPD much better than the black body of 9500 K. All spectra are normalized to intersect at 555 nanometers. ^ See the comments section of this LightNowBlog.com article Archived 2017-03-07 at the Wayback Machine on the recommendations of the American Medical Association to prefer LED-lighting with cooler color temperatures (i.e. warmer color). ^ "OSRAM SYVLANIA XBO" (PDF). Archived from the original (PDF) on 2016-03-03. ^ Wallace Roberts Stevens (1951). Principles of Lighting. Constable. ^ Williams, D. R. (2004). "Sun Fact Sheet". NASA. Archived from the original on 2013-12-08. Retrieved 2010-09-27. ^ "Principles of Remote Sensing — CRISP". Archived from the original on 2012-07-02. Retrieved 2012-06-18. ^ Chris George (2008). Mastering Digital Flash Photography: The Complete Reference Guide. Sterling Publishing Company. p. 11. ISBN 978-1-60059-209-6. ^ Rüdiger Paschotta (2008). Encyclopedia of Laser Physics and Technology. Wiley-VCH. p. 219. ISBN 978-3-527-40828-3. ^ Thomas Nimz, Fredrik Hailer and Kevin Jensen (2012). Sensors and Feedback Control of Multi-Color LED Systems. LED Professional. pp. 2–5. ISSN 1993-890X. Archived from the original on 2014-04-29. ^ Chaplin, Martin. "Water Absorption Spectrum". Archived from the original on 2012-07-17. Retrieved 2012-08-01. ^ Pope R. M., Fry E. S. (1997). "Absorption spectrum (380–700 nm) of pure water. II. Integrating cavity measurements". Applied Optics. Optical Society of America. 36 (33): 8710–8723. doi:10.1364/AO.36.008710. Archived from the original on November 14, 2014. Retrieved August 1, 2012. ^ Jerlov N. G. (1976). Marine Optics. Elsevie Oceanography Series. 14. Amsterdam: Elsevier Scientific Publishing Company. pp. 128–129. ISBN 0-444-41490-8. Archived from the original on December 21, 2017. Retrieved August 1, 2012. ^ Kern, Chris. "Reality Check: Ambiguity and Ambivalence in Digital Color Photography". Archived from the original on 2011-07-22. Retrieved 2011-03-11. ^ Borbély, Ákos; Sámson, Árpád; Schanda, János (December 2001). "The concept of correlated colour temperature revisited". Color Research & Application. 26 (6): 450–457. doi:10.1002/col.1065. Archived from the original on 2009-02-05. ^ Hyde, Edward P. (June 1911). "A New Determination of the Selective Radiation from Tantalum (abstract)". Physical Review. Series I. The American Physical Society. 32 (6): 632–633. doi:10.1103/PhysRevSeriesI.32.632. This existence of a color match is a consequence of there being approximately the same energy distribution in the visible spectra. ^ a b Priest, Irwin G. (1923). "The colorimetry and photometry of daylight ·and incandescent illuminants by the method of rotatory dispersion". JOSA. 7 (12): 1175–1209. doi:10.1364/JOSA.7.001175. The color temperature of a source is the temperature at which a Planckian radiator would emit radiant energy competent to evoke a color of the same quality as that evoked by the radiant energy from the source in question. The color temperature is not necessarily the same as the 'true temperature' of the source; but this circumstance has no significance whatever in the use of the color temperature as a means to the end of establishing a scale for the quality of the color of illuminants. For this purpose no knowledge of the temperature of the source nor indeed of its emissive properties is required. All that is involved in giving the color temperature of any illuminant is the affirmation that the color of the luminant is of the same quality as the color of a Planckian radiator at the given temperature. ^ a b Judd, Deane B. (1931). "Chromaticity sensibility to stimulus differences". JOSA. 22 (2): 72–108. doi:10.1364/JOSA.22.000072. ^ Priest, Irwin G. (February 1933). "A proposed scale for use in specifying the chromaticity of incandescent illuminants and various phases of daylight". JOSA. 23 (2): 42. doi:10.1364/JOSA.23.000041. ^ Judd, Deane B. (January 1933). "Sensibility to Color-Temperature Change as a Function of Temperature". JOSA. 23 (1): 7. doi:10.1364/JOSA.23.000007. Regarding (Davis, 1931): This simpler statement of the spectral-centroid relation might have been deduced by combining two previous findings, one by Gibson (see footnote 10, p. 12) concerning a spectral-centroid relation between incident and transmitted light for daylight filters, the other by Langmuir and Orange (Trans. A.I.E.E., 32, 1944–1946 (1913)) concerning a similar relation involving reciprocal temperature. The mathematical analysis on which this latter finding is based was given later by Foote, Mohler and Fairchild, J. Wash. Acad. Sci. 7, 545–549 (1917), and Gage, Trans. I.E.S. 16, 428–429 (1921) also called attention to this relation. ^ Judd, Deane B. (January 1935). "A Maxwell Triangle Yielding Uniform Chromaticity Scales". JOSA. 25 (1): 24–35. doi:10.1364/JOSA.25.000024. An important application of this coordinate system is its use in finding from any series of colors the one most resembling a neighboring color of the same brilliance, for example, the finding of the nearest color temperature for a neighboring non-Planckian stimulus. The method is to draw the shortest line from the point representing the non-Planckian stimulus to the Planckian locus. ^ Judd, Deane B. (November 1936). "Estimation of Chromaticity Differences and Nearest Color Temperatures on the Standard 1931 I.C.I. Colorimetric Coordinate System". JOSA. 26 (11): 421–426. doi:10.1364/JOSA.26.000421. ^ MacAdam, David L. (August 1937). "Projective transformations of I.C.I. color specifications". JOSA. 27 (8): 294–299. doi:10.1364/JOSA.27.000294. ^ Schanda, János; Danyi, M. (1977). "Correlated Color-Temperature Calculations in the CIE 1976 Chromaticity Diagram". Color Research & Application. Wiley Interscience. 2 (4): 161–163. doi:10.1002/col.5080020403. Correlated color temperature can be calculated using the new diagram, leading to somewhat different results than those calculated according to the CIE 1960 uv diagram. ^ a b Kelly, Kenneth L. (August 1963). "Lines of Constant Correlated Color Temperature Based on MacAdam's (u,v) Uniform Chromaticity Transformation of the CIE Diagram". JOSA. 53 (8): 999–1002. doi:10.1364/JOSA.53.000999. ^ Robertson, Alan R. (November 1968). "Computation of Correlated Color Temperature and Distribution Temperature". JOSA. 58 (11): 1528–1535. doi:10.1364/JOSA.58.001528. ^ Schanda, János (2007). "3: CIE Colorimetry". Colorimetry: Understanding the CIE System. Wiley Interscience. pp. 37–46. doi:10.1002/9780470175637.ch3. ISBN 978-0-470-04904-4. ^ Hernández-Andrés, Javier; Lee, RL; Romero, J (September 20, 1999). "Calculating Correlated Color Temperatures Across the Entire Gamut of Daylight and Skylight Chromaticities" (PDF). Applied Optics. 38 (27): 5703–5709. doi:10.1364/AO.38.005703. PMID 18324081. Archived (PDF) from the original on April 1, 2016. ^ Gretag's SpectroLino Archived 2006-11-10 at the Wayback Machine and X-Rite's ColorMunki Archived 2009-02-05 at the Wayback Machine have an optical resolution of 10 nm. ^ Unsöld, Albrecht; Bodo Baschek (1999). Der neue Kosmos (6 ed.). Berlin, Heidelberg, New York: Springer. ISBN 3-540-64165-3. Stroebel, Leslie; John Compton; Ira Current; Richard Zakia (2000). Basic Photographic Materials and Processes (2nd ed.). Boston: Focal Press. ISBN 0-240-80405-8. Wyszecki, Günter; Stiles, Walter Stanley (1982). "3.11: Distribution Temperature, Color Temperature, and Correlated Color Temperature". Color Science: Concept and Methods, Quantitative Data and Formulæ. New York: Wiley. pp. 224–229. ISBN 0-471-02106-7. Boyd, Andrew. Kelvin temperature in photography at The Discerning Photographer. Charity, Mitchell. What color is a black body? sRGB values corresponding to blackbodies of varying temperature. Lindbloom, Bruce. ANSI C implementation of Robertson's method to calculate the correlated color temperature of a color in XYZ. Konica Minolta Sensing. The Language of Light.